Climate information can be used as guidance for a range of weather-dependent operations. This module summarizes the Climate Analysis Process, a series of steps for determining which climatological products and data will be most useful for a specified application. The Climate Analysis Process is followed in the context of preparing a climatological brief for a ship deployment across multiple ocean basins. Though the focus is on Department of Defense data sources, including the Advanced Climate Analysis and Forecasting (ACAF) system, information on other sources is also provided. 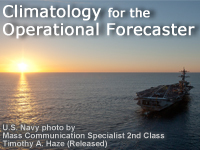 Products from the various sources are used to assemble a final climatological brief relevant to naval operations. Great info, good for the basics. This is on the job training, and education.